Posted on November 19, 2010 by Jill B. Data Robotics is just the latest digital storage company to capitalize on USB 3.0 to maximize transfer rates. 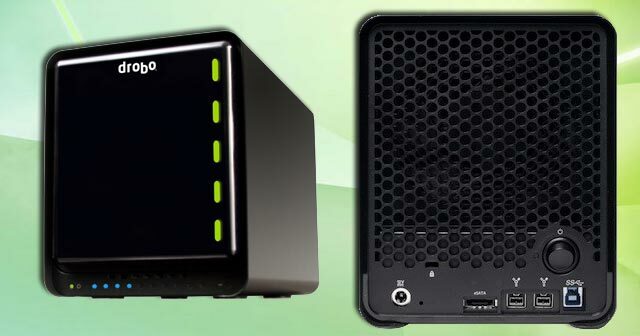 The SuperSpeed connection finds itself alongside eSATA and FireWire 800 in Data Robotics latest storage array, the second generation Drobo S. The addition of the interface means it’s ten times faster than USB 2.0 and exceeds FireWire 800 speeds by half. Built for multi-disk storage for a single volume, the USB 3.0 Drobo S handles up to five 3.5 inch SATA hard drives. In this instance, Drobo’s Direct-Attached Storage (DAS) array acts similar to a RAID. However the similarities end there. You can use nearly any hard drive no matter the manufacturer, storage capacity or cache. This feature is something you do not always find in RAID storage, which often suffers with compatibility issues. You also do not need carriers or tools to make the array and drives come together. Moreover, Drobo S does not require a lot of configuration maintenance on your part. USB 3.0 is what makes multiple volumes possible; allowing the storage array to recognize the space for new drives and therefore creates new volumes to use it. The Drobo S also has the ability to repair itself when bad hard disk or sector is detected by giving you panel signals or pop-up warnings. It automatically lets you work in a safe mode until the disk failure is taken care of. Drobo S will also protect your data in the event that a failure occurs. The SuperSpeed array is easily expandable. In any order, you can add or replace a drive. The brands and capacities don’ have to match. This combination of flexibility means that this storage array is adaptable for long term use, as storage sizes on the market continue to grow. The idea of a USB 3.0 storage array like this can protect the initial investment you make into a storage array that for some, could cost a small fortune. The Drobo S has a starting MSRP at $799 and provides different price points from there depending on the disk drive bundle you want. The maximum 10 TB bundle retails at $1,799. Are you intrigued by the easy setup and USB 3.0 interface? Would you buy a new Drobo S, and what do you think it’s best suited for? This entry was posted in Articles, Drobo, SuperSpeed USB 3.0, USB 3.0, USB Flash Drives and tagged Data Robotics, Drobo, Drobo S, Drobo Storage Device, DroboElite, DroboPro, Storage Device, SuperSpeed USB 3.0, USB 3.0, USB 3.0 Drobo S. Bookmark the permalink.